Not sure why I do this to myself. I mean, I love doing it, but why can't I do it within a normal time frame and at a normal hour?? 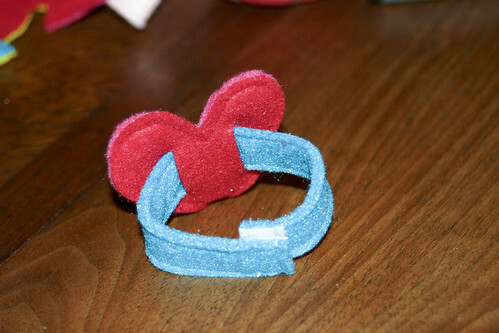 Since last year when I saw these, I knew just what I'd be doing for the girls' valentine's exchange. But I didn't fully realize how long it would take nor factor in the fact that I'm too busy with kitchen cabinets. 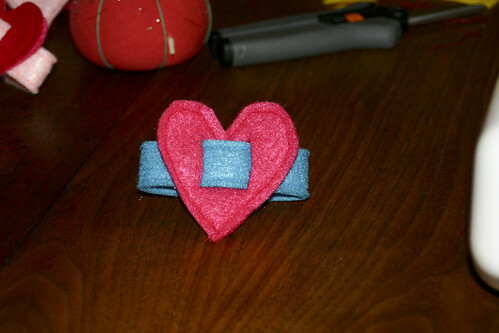 Regardless, last night I was up very, very late making these. Big Sister helped for awhile before going to bed, but that mostly consisted of me telling her not to turn off my sewing machine, not to cut anything, and not to stab herself with pins. 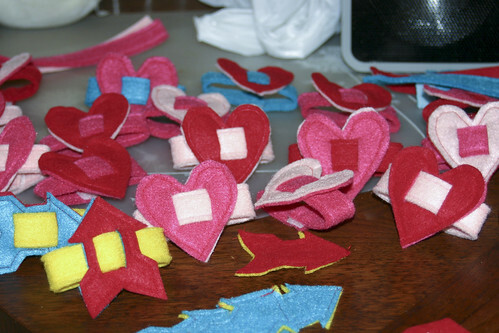 In the end, she "helped" by taking the pins out of the hearts that I had already pinned together and putting one pin into each separate heart. I showed them to the girls this morning and they LOVED them. Big Sister was so excited to give them to her friends and Little cried when I put them back in the bag. Sort of makes the whole thing worth it, don't you think? Great idea. 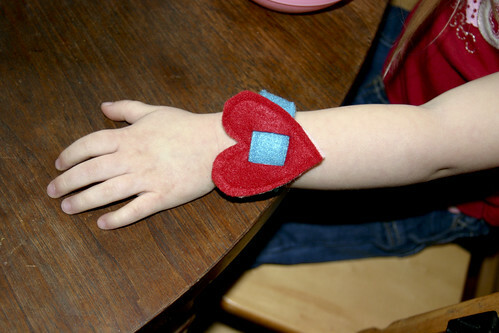 I made Ella a V-day cuff bracelet and wanted to make one for Huds but couldn't think of a manly version. The arrows are great. Too cute. I'd like to make something for my students next year. Can you give me details on materials etc. A little glimpse. . .
crossing things off the list! Old Friends & New Babies!! Why can't I just use stickers?? Little Sis taking matters into her own hands?? ?